An updated version of this page is found here. 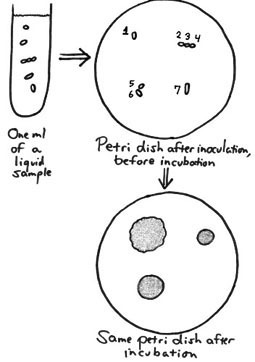 When we are putting bacterial cells in contact with the medium in a petri plate – such as when we inoculate a certain amount of a natural sample into a plate or use a loop to streak a plate from a sample or culture (just to give two of many possible examples) – we expect the microscopic cells to multiply and ultimately form masses of cells visible to the naked eye. These macroscopic masses are called colonies, having been formed by cells which are able to utilize the nutrients in the medium under the conditions in which the plates are incubated. Besides nutrients, we have to consider temperature, oxygen availability, and other factors that are conducive for metabolism. When we observe colonies, we cannot assume that each arose from just one cell originally planted on the medium. A single cell – or a pair, chain or cluster of cells – can begin to undergo cell division on the plate and produce more copies of themselves, ultimately resulting in the formation of a visible colony. Also, two or more separate cells which "land" on the medium in close proximity to each other can multiply, merging their growths into a single developing colony. Thus, we use the term colony-forming unit when we consider the common origin for the cells of any colony. This term is usually abbreviated CFU. In the diagram at right (wherein we exaggerate the size of the cells as well as the amount of liquid in the tube), we have – as an example – a test tube containing one ml of a water sample which contains some bacterial cells, and we pour that one ml onto a plated medium in order to determine something about the quantity of viable bacteria in that one ml sample of water. (Normally we would not know how many cells we are dealing with – nor how they are distributed on the plate that we inoculate – as we use this method to detect viable cells only by the visible colonies they ultimately produce.) Notice that in this scenario, three of the cells (#2, 3 and 4) are in an unbroken chain, and they land together; also two cells (#5 and 6) land close to each other. We also have a viable cell (#7) that is unable to metabolize at all under these conditions; perhaps it needs something that is not present in the medium, or maybe the incubation temperature is too warm or cold. The cells able to metabolize and reproduce (usually by binary fission where 1 cell forms 2, the 2 form 4, the 4 form 8, etc.) ultimately form colonies during the incubation period. However, as you see, the common origin for the cells of any colony can be more than one cell, such as that chain of cells (#2, 3 and 4) or the two cells which "start out" very close together (#5 and 6). By finding three colonies arising from having inoculated that one ml of water, we cannot therefore say that there were three cells per ml of that water sample. We can only say that there were three colony-forming units per ml. One must realize that a bacteriological medium – even one full of nutrients and considered an "all-purpose" medium – cannot support all of the various bacterial species. Cell #7 finds itself unable to reproduce, and it goes unrepresented in the colony count. Whether or not colonies are counted, they arise from CFUs nonetheless. So "colony-forming unit" is not a term that is restricted only to quantitation. On occasion, cells of different species can constitute a CFU, and the resulting colony would then be considered a mixed culture. Hence, thorough mixing of the sample and good isolation methods are essential. Re-streaking isolated colonies on a non-selective medium can enhance the detection of different organisms. Of the various types of cells that bacteria can produce, the discussion above has only considered vegetative cells – the type of cell common to all species of microorganisms, being the basic living unit that can metabolize and reproduce. What about spores? Reproductive spores and endospores are special types of cells that vegetative cells of certain kinds of bacteria can give rise to (in the process of "sporulation"), and this generally occurs when the environment is beginning to run out of nutrients. Can such spores be considered colony-forming units? Most emphatically yes! In order for a spore to serve as a colony-forming unit when inoculated onto a plate containing a suitable medium, it has to germinate into a vegetative cell which can then reproduce on the medium and form a colony of vegetative cells. (And then, when the nutrients in the medium begin to run out, sporulation can occur anew.) Note how we can use a heating method to eliminate potential colony-forming units except endospores in the discussion of our Bacillus isolation experiment here. Page last modified on 11/23/09 at 7:00 PM, CST.